It’s 2011, all over again. Sarah Palin has started to run away with the Republican Party’s nomination process, and the primaries are now seen as a mere formality. President Barack Obama is clinging to power in the United States, battling against elements of his own Party, led by former Secretary of State Hilary Clinton. After a failed nuclear showdown with North Korea, Clinton has emerged as the odds-on favourite challenger to Obama for the Democrats’ 2012 nomination. With rising food and oil prices, and the global economy in turmoil at the end of 2011, the next U.S. President will be forced to lay out a viable policy for American’s new Cold War against China. Closer to home, 2011 proved to be a one-two punch for Conservatives on the federal and Ontario provincial scene, as Stephen Harper’s party steamrolled to a victory which saw both the Liberals and the NDP lose seats to the new Big Blue Machine. Only the Bloc in Quebec managed to hold onto its centre of power. Resigning in disgrace on election night after losing his own seat, former Liberal Party Leader Michael Ignatieff has handed the reigns of power over to interim Leader Ralph Goodale, although it has been Bob Rae who has emerged as the real guiding light of the Liberal Party. In Ontario, Provincial PC Leader Tim Hudak ran a flawless campaign which gave him a convincing majority government at Queen’s Park, despite Sudbury returning Liberal Rick Bartolucci and New Democrat France Gelinas to provincial parliament. And the Pittsburgh Penguins won the Stanley Cup on home ice, in 7 games over the Vancouver Canucks. And that’s the way the year 2011 unfolded, according to my own Crystal Ball predictions, made almost a year ago today, in a three-part blog series. Predicting the future is a mug’s game anyway, and I’ve never had the best track record. My predictions for 2011, though, were at a particularly low point, thanks in large part to the many significant stories which I did not, maybe even could not, have predicted, including the massive uprisings throughout the Middle East, and the worldwide Occupy Movement, which may have now spread to Russia in the guise of pro-democracy protests. Throw in an earthquake and tsunami in Japan, a rising Orange Tide in Canada, and Michele Bachmann, and, well, even the boldest predictions can go out the window. I was, however, right on the money with a few predictions, including my call that we would have a spring federal election which would finally give Stephen Harper his coveted (yet false) majority government. Of course, I had been predicting an election about every 6 months since the fall of 2008, so I was bound to hit the nail on the head out of sheer tenacity at some point. I also did predict that Michael Ignatieff would lead the Liberals to their poorest showing ever, and resign in disgrace on election night after losing his own riding. Those were about the only federal election predictions I made which came true, however, as I also predicted that the NDP would lose seats, with modest gains made by the Bloc. I based my predictions for the federal election on the idea that the election would be portrayed by the mainstream media not as a battle about two competing ideas of a vision for Canada, or even about policy. Instead, I predicted that the media narrative would depict the election as a battle between Harper and Ignatieff, with all other issues being sidelined. I termed this a “clash of personalities” and predicted that Ignatieff would become the easy casualty in such a clash. I still think that I was bang on the money with that prediction, except not even I could predict how quickly the media would tire of its own narrative, once a battered and bruised Ignatieff became someone to be pitied. The clash of personalities which I had predicted turned into watching an elephant squash a terrified mole each and every night on our television sets. A mole which couldn’t find the red door of escape, and instead banged up against a blue door which forbade entry. And that just doesn’t make for good TV. Interestingly, what changed the media’s narrative had absolutely everything to do with the media itself, although few are acknowledging the important role which the media played in driving the counter-story to the narrative. Clearly, part way through the election, NDP Leader Jack Layton was elevated to a status he had not previously enjoyed, and which the media script could not handle. I still recall watching the media begin to scramble about 3 days after the televised English language debate, when the first polls out of Quebec began showing a significant rise in NDP support there. The media was flabbergasted, and at first, disbelieving. Well, who could have predicted this? I, at least, found myself in good company, missing as I did the 2011 Orange Crush. Yet, the Orange Crush itself really was largely a Quebec phenomenon, which only led to modest changes in the rest of Canada. Of course, in some ridings (especially in the Greater Toronto Area), better-performing NDP candidates might have led to the election of Conservatives, but it’s not entirely clear that the Cons wouldn’t have been elected there anyway, even without a hyped-up NDP. It wasn’t the strong NDP campaign in Quebec which led to its electoral success there. Indeed, pundits are taking away a completely different message from the NDP in Quebec, one which suggests that the days of the local campaign are largely over, except perhaps in specific ridings. No, it was Layton who bootstrapped the NDP’s Quebec candidates to himself, after appearances on the extremely popular tv talk show, Tout le Monde en Parle, as well as a convincing performance against Gilles Duceppe in the televised French language Leader’s debate. Sure, Jack was just being Jack, and after 9 years on the federal political scene, he had become very good at being himself. Nevertheless, the stars became aligned for NDP success: national and Quebec-specific exposure as a singular alternative to Stephen Harper (and Gilles Duceppe) through the televised Leader’s debates and French language TV, at a time when the mainstream media’s own Harper vs. Ignatieff narrative was becoming uninteresting. Without this kind of exposure (or had Layton himself been challenged by another strong contender during the Leadership debates, such as the national Party Leader who was not invited by the media consortium to attend the debates), I have no doubt that the electoral outcome for the NDP would have been quite different. Unfortunately, my prediction that the federal election outcome would be based on style instead of substance proved to be entirely accurate. The media’s attention span proved to be the shortest in my memory, and although policy announcement after policy announcement was rolled out by each political party, the duration for reporting on policy lasted roughly one day, and then the media moved on. The only stories which seemed to generate traction were, initially, the Liberal coalition story (until Ignatieff was finally able to convince the media that he really wouldn’t enter into a coalition with the NDP); the Conservative’s expulsion of young people from staged rallies, because they had Facebook friended politicians from other parties; and following the public opinion polls (which were more of a story than Jack Layton’s rise). In fact, coverage of the polls dominated the entire election, at the expense of all else. This kind of coverage, which ultimately chooses a winner before any votes are cast, might well be the main culprit for Canada’s low voter turn out. If the polls say that your preferred candidate isn’t going to win, well, why bother take the time to vote? I predicted the worst voter turn-out of any election in Canadian history, and I got it wrong. It was only the second worst, at 61%. When you consider the notion that only about 37% of voters aged 18-24 typically cast ballots in a federal election, is it any wonder that Canada’s political parties aren’t paying significant attention to the youth vote? I’ll have a little more to say about trends in polling in my upcoming blogs about predictions for 2012. I continue to believe that I correctly called a majority Progressive Conservative Party victory correctly, as did most pundits at the beginning of the year. It’s not that we were ultimately proven wrong, it was that history simply didn’t unfold the way it was supposed to have. That Tim Hudak is not the current Premier of the Province of Ontario is simply a cosmic oversight, and one that is likely to be corrected in due course. Which is not to suggest that credit isn’t due to Dalton McGuinty and his Liberals, even if just for hanging on to a minority government. At the outset of 2011, it was a foregone conclusion that the Liberals would be replaced here in Ontario. However, Hudak had a very difficult time connecting with voters, largely due in part to a disinterested media. Unlike with federal elections, it is still very difficult for provincial politicians to capture the media’s full attention, especially now that so much of our mainstream media has consolidated, and there is often little local coverage. And when you’re competing with national and international stories, the amount of space designated for provincial election coverage is nowhere anything like what we see for a federal election. Hudak burst out of the gate by shooting himself and his party in the foot, with ambiguous comments about “foreigners” taking Canadian jobs. McGuinty took the highroad and we all watched as Hudak’s already-evaporating public opinion lead vanished before the damage control teams managed to pry the “foreigner” talking points out of the hands of all candidates (about a week later). By that time, the damage was done, and Hudak never recovered. The NDP made modest gaines, with Andrea Horvath running a very lacklustre campaign, targeting voters who…well, who knows? The NDP was all over the map, policy-wise, in this past election, promising a little bit of everything to every one, which failed to connect significantly with voters. Fighting for space in the limited media narrative, Horvath found it mostly because she was a new face, a scrappy opponent, and because the NDP had recently gained popularity federally, due to Jack Layton’s rise to Leader of Her Majesty’s Loyal Opposition, and to his tragic and untimely death. Horvath and Hudak did little to change voters minds during an underwhelming televised Leadership debate, which saw McGuinty and his hands out-perform the other candidates. Of course, there was another provincial party which was running candidates in each and every riding in Ontario, whose Leader was not invited by the broadcast consortium to attend the debate. More on that later. I predicted that the provincial election would see the return of MPP’s Rick Bartolucci and France Gelinas to Queens Park, which did happen (although I have to admit that, although I did not predict how close the race was here in Sudbury, it’s fair to say that I would have completely missed that, and instead have predicted that Bartolucci would have returned with a healthy, if somewhat reduced, margin, rather than just squeaking back in). Federally, I predicted an easy victory for Nickel Belt’s MP Claude Gravelle, but I had Sudbury’s NDP MP Glenn Thibeault going down in defeat to Conservative Fred Slade, largely over Thibeault’s flip-flop on the gun registry. I received a lot of flack from friends for that bold prediction, which later proved to have missed the mark considerable, as Thibeault was returned with over half of the popular vote, a much wider margin than he was elected with for the first time in 2008. Interestingly, however, was despite a very lacklustre campaign in which Slade took a lot of heat for ducking local debates, Slade still managed to increase the Conservative’s popular vote in Sudbury over 2008 figures, and vault the Conservatives ahead of the Liberals in this riding. Liberal Carol Hartman’s campaign went as well as it could, I suppose, but she was impacted throughout by an incredibly lacklustre federal Liberal campaign. So, I got 3 out of 4. 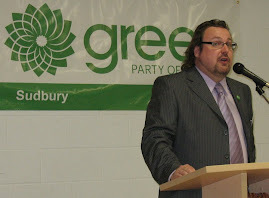 As I’m the CEO of the Sudbury Federal Green Party Association, I like to provide a little bit of focus on the Green Party in my end of year blogs. Last year, I predicted that Elizabeth May would not be invited to attend the televised Leader’s debates, and received a little bit of flack from my colleagues in the Party, who remained convinced that the Broadcast Consortium would have no choice but to invite her again, after her appearance in 2008. And it may have seemed to some that the Green Party’s entire national electoral strategy hinged on May’s participation in the debate. Interestingly, it didn’t, although I don’t believe that was apparent to many in the Party. Clearly, there was a contingency plan in place for the time when May was told that she wouldn’t be welcome to participate in the debate. The Party would not be caught off-guard again in the same way that it was in 2008 when the Consortium came to the same conclusion to exclude a national Party leader. Of course, the circumstance in 2008 was actually different for the Greens than it was in 2011, as Blair Wilson had announced that it was his intention to sit in the House as a Green MP when parliament reconvened. Wilson never got that chance in 2008, as Stephen Harper broke his own fixed-date election law and pre-empted Wilson. That left some debate as to whether there was actually a Green MP in Ottawa or not, and it could have been that ambiguous circumstance which led the Consortium to conclude that despite leading a national political party which runs candidates in each and every riding across the nation, and despite receiving a per-vote federal subsidy, the Green Party should be kept from participating in the debate. It was only after a significant public outcry which ultimately convinced Jack Layton to publicly change his mind and not oppose May’s inclusion in the 2008 debate that the Consortium relented. To this day, I can not forgive Jack Layton, who claimed to champion democratic values, for his continued opposition to allowing May to participate in the debates. That many grassroots members within his own Party stepped up and demanded May’s inclusion reflects well on his Party. In 2011, when the writ was dropped, there were clearly no Green MP’s in the House, and the Broadcast Consortium quickly announced its decision to sideline May. That none of the other federal political party leaders (and the Bloc Quebecois, too, which isn’t even a national party) stood to oppose the Consortium’s decision was clearly a travesty for democracy in Canada. However, from a purely political point of view, it only made sense, as May’s presence would have led to additional national exposure for May and the Green Party, which would have at the very least made May look like a contender for the Saanich-Gulf Island seat she was challenging. That this sort of politics of opportunism which the other party’s played on does nothing but increase the level of cynicism and disrepute which politicians throughout this country have from the general public doesn’t appear to matter. May went on to win a seat in Saanich-Gulf Islands (SGI), handily defeating Conservative cabinet minister Gary Lunn after running an aggressive campaign (May is a tireless campaigner). I predicted that Lunn was going to be returned, in part due to a strong challenge from Liberal Renee Heatherington. Heatherington’s campaign, of course, was hampered by a poor national campaign under Ignatieff. But let’s not kid ourselves here – approximately a half million dollars from Green Party coffers was poured into SGI both pre-writ and during the campaign. The riding was flooded with Green volunteers, some of whom slept in shifts because there was not enough room at the inns. All of this added to the fact that May herself is a star candidate, and that she and her message resonated with the voters in SGI, probably to a degree moreso than any other riding in the country (polling had been done earlier to show that SGI was likely the most "Green-friendly" riding in Canada). And that was the Green Party’s national campaign strategy in a nutshell. And this was never a secret to anybody who had been paying attention to the Green Party. There’s even a term for this kind of strategy: a “beachhead”. It was successfully implemented by UK Green Party Leader Caroline Lucas, who won the Green’s first seat in the British parliament with an up-the-middle win in Brighton Pavillion in 2010. Rather than investing in a “rising tide” national strategy which would have seen strategic assets dispersed to many ridings during the federal election, the Green Party placed its eggs in one basket and hoped for a single positive outcome. While May’s participation in the televised Leader’s debate would have been helpful to her chances in SGI (and for candidates throughout the country), it wasn’t completely necessary. May’s victory goes to show what a large, dedicated and well-funded political machine can do in terms of achieving electoral results. That it played out in only one riding for the Green Party is simply a matter of scale. If you look at the factors which contributed to the overall success of the Conservative Party, it is difficult to conclude that the only way to political success is to out-spend your opponents. That the Greens managed to do this in one riding out of 308 is, actually, a remarkable accomplishment for the Party, and one that I did not foresee occurring. Now, with national exposure in Ottawa, May has been on the mainstream media’s radar a lot more often. In 2011, she was the lone voice who opposed the continuation of Canada’s bombing mission in Libya, much to the chagrin of those grassroots NDP supporters who clearly understood that Canada had chosen sides in a civil war. And recently, May has been on the frontline of opposition to Canada’s notice to withdraw from the Kyoto Accord. That the federal Green Party saw its overall electoral support drop down to below less than 4% (from a high of 6.8% in 2008) may prove, in the long-run, to be less important for the Party’s overall success than having May in the House for 4 years. Personally, I think it will be, and that there will prove to be significant opportunities over the next few years for the Green Party to grow its support. The 2011 low support figures can be chalked up to May not being invited to the debate, along with a surging NDP. But May must now ensure that she is invited to the next televised Leader’s debates, which means that she must stay on as Party Leader over the next 4 years. That the decision to attend these critical public debates remains in the hands of an unaccountable group of broadcasters who have their own vested interests means that the ultimate decision will not be up to May. My prediction regarding the Green Party of Ontario’s success, however, proved to bang-on. I had said that the Green Party of Ontario would perform poorly in the provincial election, and would not elect anybody. But let’s examine what did happen to the GPO, which saw its share of the popular vote drop from 8% in 2007 down to less than 3% in 2011. What happened? Well, again, unlike in other provincial jurisdictions, Green Party of Ontario Leader Mike Schreiner was not invited to attend the televised Leader’s debate. Not being invited to attend the debate is a significant signal to voters that a Party really isn’t to be taken seriously. This was the second election, however, in which the Green Party ran candidates in each and every Ontario riding. The decision of the Consortium not to invite Schreiner remains a curious one, given that Greens participated in televised Leader’s debates this year in Manitoba, and earlier in PEI, British Columbia, Nova Scotia and New Brunswick. In Saskatchewan, the Green Party became that province’s third party. Media, however, continues to take its cues from, well, itself. Not only did the provincial media giants choose to marginalize the Green Party of Ontario by not inviting Schreiner to the Leader’s debate, largely the GPO itself was completely marginalized from all pan-provincial conversations. Reading the editorials of the political pundits, and watching the TV news coverage, it was almost as if the Green Party didn’t exist (only to be rediscovered on election night when the results needed to be reported, and then, in some cases, wrongly identifying its candidates as “Independents”). Only TV Ontario decided to give the Greens a bit of a break, by including Party candidates and pundits in news programs, where seats had traditionally only been reserved for the PC’s, Liberals and NDP. TV Ontario expressed that the time was right to include Greens in their programming, as the GPO offered unique opinions and expressions on issues important to Ontarians. Imagine! However, the quality of GPO candidates and pundits left a little something to be desired at times. “Unsteady” seems to be a good choice of words to describe the performance of GPO candidates especially (the pundits, generally, fared a little better). Of course, keep in mind that it is far more difficult to look good when you have to perform in sound bites, when your Party doesn’t provide you with talking points, and when your whole rationale for becoming a candidate in the first place probably has a lot to do with wanting to do politics differently. So GPO candidates were forced to give a performance on TV which, in and of itself, was likely something which they were in opposition to. However, some of the GPO’s amateur decisions related to TV Ontario simply can not be overlooked, including one near and dear to my own heart, which saw the GPO sending a candidate from Scarborough to attend a TV Ontario panel discussion on Northern Ontario. That decision, quite simply, blew my mind, and really did speak volumes about the political naiveté of the Party. There appeared to be little in the way of an electoral strategy implemented by the Party, although clearly more resources were being expended in a few ridings in Southwestern Ontario. Bruce-Grey-Owen Sound, where the Party did very well in 2007 under Shane Jolley, ended up nominating a different banner-carrier for the Party, and saw Jolley run as an independent, which was a blow to the Party, given that popular PC MPP Bill Murdoch had stepped aside. In fact, the Green Party of Ontario placed no candidates in second spot anywhere in the province, and had but 1 third place finish. With a minority government in place now in Toronto, the GPO has its work cut out for it to remain relevant, given that there is likely going to be an election within the next couple of years. Internationally, I predicted that Sarah Palin would enter the GOP nomination race, and run away with it. I believe that Michele Bachmann’s entry might have derailed Palin. And that’s too bad for Palin, because the state of Republican contenders at the end of 2011, I continue to think that she might have done very well had she thrown her hat in the ring. That the world may be a safer place for her decision, well…if Bachmann or Perry end up taking the nomination, it may be hard to tell. I actually didn’t predict war in Korea, but I was hedging my bets a little. You may recall that at the end of 2010, both North Korea and South Korea had become quite belligerent over the North’s shelling of a Southern military installation on an off-shore island. Now, at the end of 2011, North Korea is back in the news again, with the death of their Dear Leader, Kim Jong-Il, and the rise to power of his untested son, Kim Jong-Un. In Australia, I predicted that Prime Minister Julia Gillard’s coalition would fall. It hasn’t. In Britain, I predicted that Prime Minister David Cameron’s coalition would continue to survive, despite being wracked by protests, which did happen (will it continue to survive, with the Conservative’s anti-Europeanism? I’ll weigh in with a prediction in my next post). I predicted the fall of the Zardari government in Pakistan, with the military stepping in and taking control. That hasn’t happened yet. In Iran, I predicted that despite rising tensions, nothing much would happen beyond rhetoric. And that’s largely played out. What I didn’t predict or write about in any way was the growing unrest throughout the Middle East, led by protests in Tunisia and Egypt. Although I was aware of a growing sense of anti-government sentiment in some parts of the Middle East and North Africa (particularly in Yemen and South Sudan, which achieved its independence this year), I didn’t think that the sentiment would prove newsworthy. Boy, did I blow that one. I did predict unrest in Europe, as a result of the economy and austerity measures, particularly in Greece, Spain, Portugal and Italy. But everyone was predicting that at the end of 2010, which only goes to show for how long now this crisis has been brewing. What I did not foresee was a global movement based rising out of North America, based on consensus decision-making and a desire to close the gap between the rich and poor, by drawing attention to issues of economic disparity through the occupation of public spaces. And a nuclear meltdown in Japan? Forget about it. I’ve lived my life, up until this year, firmly entrenched in my belief that the nuclear power industry in first-world nations was one of the safest industries in the world. I’ve had to deal with seeing my own beliefs challenged and ultimately, come crashing down, as the disaster in Japan unfolded over weeks and months. What I have taken away from Fukushima is not just a significant degree of concern related to nuclear power generation, but my eyes have been opened to the extent which the nuclear power industry has gone to cover up environmentally damage, and not just in Japan. Remember that when Fukushima was unfolding, there was no talk of a meltdown, and we were all being reassured by the nuclear industry and a compliant mainstream media that the disaster would be contained, and evacuees would be able to return home. Then, doses of radiation started showing up unexpectedly (and inexplicably) in places where no one had been looking for it. The evacuation was extended to a larger geographic area. Iodine pills were flying off the shelves by a population who were growing increasingly sceptical that they were getting the straight goods from their governments. Eventually, the government of Japan fell over its handling of Fukushima, but word has been very slow to leak into the mainstream media in North America over the true extent of the nature of devastation in Japan. It is not now largely known that 3 reactors at Fukushima have, in fact, experienced meltdowns. The time has clearly come to say no to this dangerous and poisonous form of power generation. That Germany, Italy, Denmark and Japan all did so in the wake of Fukushima is to their credit. That we here in Canada and especially in Ontario continue to contemplate building new nuclear reactors shows, to me, a complete lack of foresight and visionary thinking on the part of our political leadership. Not only is nuclear power dangerous, it is also the most expensive form of commercial power ever to be generated, once all costs are factored into the equation. Not to mention the costs of cleaning up after a disaster like Chernobyl or Fukushima. So, that’s my 2011, now appearing in the rear-view mirror. I’ll share with you my predictions for 2012 over the next couple of blogposts. Hope you enjoy!